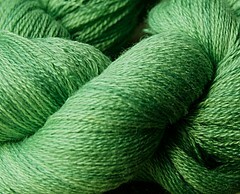 Finally May has arrived and so have some new yarns! Life has been hectic around the farm as we finished a round of spring festivals last week and now transition to selling at the farmers market beginning this week. A few events are scattered through the warm months but I’ll be glad to settle into a some sort of routine, even if it includes the alarm going off at 3:15am every Saturday. Introducing a line of Oklahoma Fibers featuring the partnerships of Lost City Knits with Cordero Farrms and Country Garden Farm. Other Oklahoma Fiber partnerships will be added in the near future. At this time these yarns will only be available for purchase at the Cherry Street Farmers Market in Tulsa. As an Oklahoma Grown Market only fibers from our state can be sold at the market – as it should be. Customers know they’re supporting local agriculture and farmers have a willing marketplace for their goods. October 2007 I made the pilgrimage to New Mexico for the Taos Wool Festival. The very ground along the Rio Grande felt sacred, and everywhere I looked people wore stunning turquoise and silver jewelry. For centuries the Pueblo have mined turquoise from the hills of Cerrillos and along the Turquoise Trail, for use in jewelry. 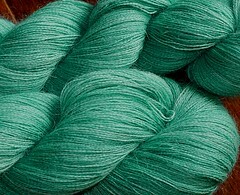 Here is a colorway inspired by that sacred gem to knit lace as bold as New Mexico. Wine, when chosen well, is a lovely way to accentuate the flavors of a meal or dish. 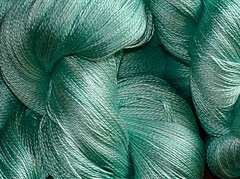 Lost City Knits’ Bacchus, named for the Roman god of wine, will enhance your lace knitting experience in the same way. One skein is enough to make you tipsy. Two and someone else had better drive. When I was young my mother dabbled in African Violets. A grow light insured the optimum exposure on the shelf full of small fragile blooms nestled atop velvety green leaves. 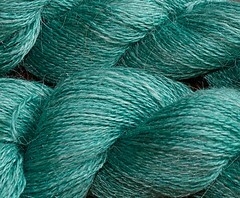 This yarn brings the beauty of that color out into the world when you knit a scarf or shawl. There comes a point in the life of well-loved blue jeans when you put them on and you realize they’re just now perfect, not as dark as they once were, and quite a bit softer than when new. Before long, they’ll start wearing thin. It’s the perfect moment for jeans. This is that color. But llama spun with Tencel means, unlike those perfect jeans, this yarn is as strong as ever, and will make a handsome scarf to wear with your jeans. The sandstone walls of the Grand Canyon can turn orange at sunset. The shades will range from gold to deep red-orange as the light dwindles. After a long day don’t you want to sit and watch the colors change as the shadows lengthen? Here is a gentle southwestern inspired colorway. For those customers who may not be in the Tulsa area on Saturday mornings, I’ve added a few of these colorways to the existing yarns. 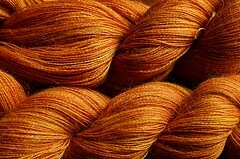 More colorways will be added in the full range of Lost City Fibers as time allows. If there is a colorway you’re particularly itching for but I haven’t posted it in the fiber you prefer, shoot me an email and I’ll try my darnest to make that happen. 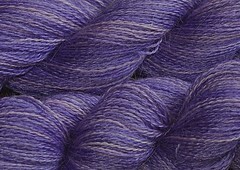 African Violet in Merino will be available by Monday! PreviousPrevious post:New Colorways coming later today!NextNext post:Thank goodness it's Monday!